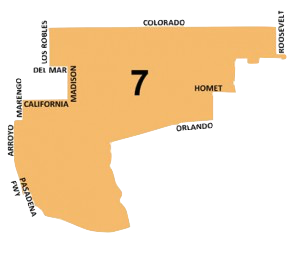 Please join us for a District 7 Meeting on Wednesday, April 4th at 6:00 p.m. The meeting topics will include a discussion of the proposed sales tax increase for Pasadena, and the proposed Cannabis regulations and associated business tax, both which will be 2018 ballot initiatives for our residents. The meeting will be held at PUSD Headquarters, 351 South Hudson Avenue, 2nd Floor Board Room 236. Parking is available in the surface lot on Del Mar Boulevard and Hudson Avenue. The City has launched Our Pasadena, the program to update all eight Specific Plans throughout the City as well as the Zoning Code. Our Pasadena moves the General Plan forward with a focus on implementation—updating Pasadena’s Zoning Code and establishing neighborhood-specific design and land-use goals for all eight of the City’s Specific Plans: Central District, East Pasadena, East Colorado, Fair Oaks/Orange Grove, Lamanda Park, Lincoln Avenue, North Lake, and South Fair Oaks. The Zoning Code will be updated to establish... continue reading »"City Announces "our Pasadena" Program to Implement the Updated General Plan"
Arroyo Seco Weekend Announces 2018 Program! GoldenVoice has announced the line-up for this year’s Arroyo Seco Weekend.